St. Bruno was born in Cologne to a prominent family. We know that he studied at Rheims, and was ordained at Cologne becoming a Canon at St. Cunibert’s. Eventually he returned to Rheims and became the head of the school teaching Theology, and was appointed Chancellor of Rheims. St. Bruno was forced to flee Rheims when he denounced Manasses in 1076. Bruno later returned to Cologne but went back to Rheims in 1080, when Manasses was deposed. The people of Rheims wanted to make Bruno the Archbishop, but he declined, wishing to pursue a different path. He became a Hermit, and eventually moved to Grenoble with his companions in 1084. Bishop St. Hugh of Grenoble assigned a place for their hermitages in a secluded area called La Grande Chartreuse. They built an Oratory and individual cells, following the rule of St. Benedict. His group became the Carthusian Order. They embraced a life of poverty, manual work, prayer and transcribing manuscripts. The fame of the group spread, and in 1090, St. Bruno was brought to Rome against his wishes by Pope Urban II, whom he had taught at Rheims. He was made Papal Advisor in the reformation of the clergy. He persuaded Pope Urban to allow him to eventually resume his hermit life, and was sent back. He remained there until his death on October 6th. Pope Leo X granted permission to celebrate his Feast, and his name was placed on the Roman calendar in 1623. 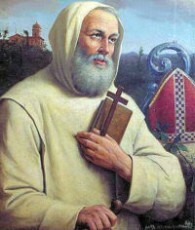 St. Bruno was known for his ability to understand the faith. He was asked to be Archbishop, but turned it down to become a Hermit. He desired to find God in the stillness, separated from the world. He eventually was brought to Rome by Pope Urban II, to be his Papal Advisor, but was allowed to go back to Cologne and continue his life as a Hermit. He was very popular, and knowledgeable in the faith, but wanted to remain in union with God, as a Hermit, separated from the world.